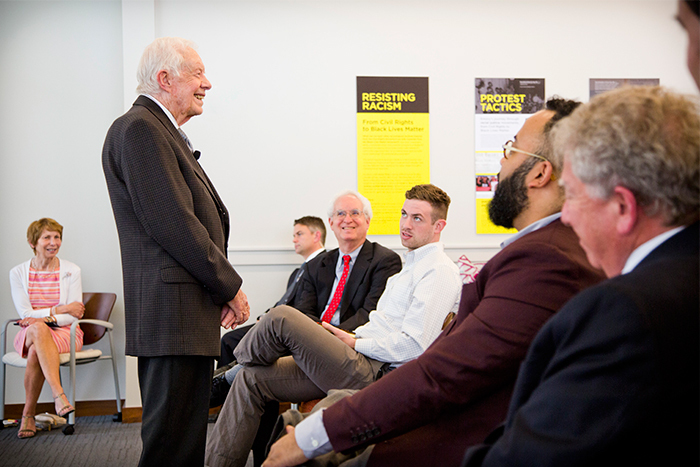 In a conversation with students at Emory's Rose Library, former President Jimmy Carter shared candid thoughts on politics, history and the importance of archives to understanding contemporary issues. 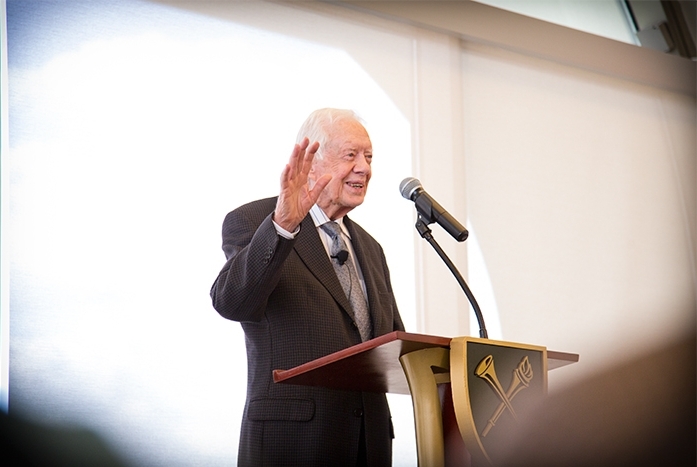 Former President Jimmy Carter spoke to students from two classes April 21 in the Stuart A. Rose Manuscript, Archives and Rare Book Library. In a session called “Why Archives Matter: Memory, Meaning and History,” he shared his candid thoughts on politics, history and the importance of archives relating to contemporary issues. Students from history professor Joseph Crespino’s class on American politics and race, and from journalism professor Hank Klibanoff’s class on the Georgia Civil Rights Cold Cases project, joined Carter for the session. Each student has conducted research in the archives at least once, and some as many as three times during their college years. Archivists and students working in the Rose Library also joined the discussion. Rose Library director Rosemary Magee invited Carter and other guests from The Carter Center to see the renovated Rose Library; he had used space on the 10th floor as his original office when he came to Emory as University Distinguished Professor in 1982. She asked him to reflect upon the space and also the value of archives to an understanding of the present as well as the past. 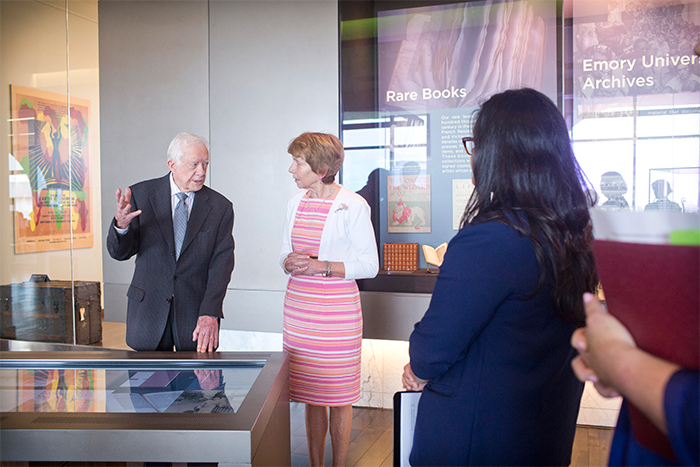 Carter discussed the importance of preserving and archiving history, especially the records of those people who have firsthand knowledge of events. He devoted most of the session to answering students’ questions about his own history as Georgia governor and U.S. president, as well as on issues such as the 9/11 Commission report, the importance of archiving documents and their impact on future decisions, and how personal narratives affect history. Carter’s archive experiences during his presidency include his efforts to preserve the Alaskan wilderness for the U.S. National Park Service. Carter took on the decades-long, deadlocked issue, opposed by Alaska’s congressional representatives and “almost everyone in Alaska,” he said. Carter said he and his team searched archives and found the Antiquities Act of 1906, which allowed him, as president, to establish a historic site, such as an ancient courthouse or church building, and designate it to be saved for the future. In addition, the law didn’t have any limitation on acreage, which allowed Carter to designate large areas of Alaska — some 43 million acres — as historic sites. Students asked Carter challenging questions about modern dilemmas. Jack Kuhr, a senior history major doing an independent study in Klibanoff’s civil rights class, asked Carter for his opinion on the 28 pages of the 9/11 Commission’s report that the U.S. government is debating whether to release to the public, regarding the Saudi government’s possible involvement in the terrorist attacks on Sept. 11, 2001. “We talked about the importance of documenting history — what’s your opinion on hiding history and not archiving history due to national security issues?” Kuhr asked. Carter added while there are reasons for making some documents classified for matters of national security, he felt they should be released as soon as possible after the security issue had passed. Releasing documents and archiving them presents opportunities for lessons to be learned from history, he said. One student asked him to recall a time when archives or historical memory played a healing role in a community. Carter talked about the Camp David Accords, signed in September 1978, when he spent 13 days sequestered with Israeli Prime Minister Menachem Begin and Egyptian President Anwar el-Sadat. The accords paved the way for a peace treaty between the two countries signed in March 1979, which ended a 30-year war. "A vibrant model to us all"
Josh Niemtzow, a senior political science and history major, asked Carter a question about a detail from the 1966 campaign for Georgia governor. The two politely disagreed for a few minutes, with Carter remembering things differently from what Niemtzow’s research yielded. After the session, Niemtzow said he enjoyed interacting with the former president. Niemtzow has used the Rose Library archives three times during his years at Emory — first in his freshman year for a paper on the 1964 Civil Rights Act, then last semester for a paper on Holocaust education in Germany, and again this semester for his research paper on former Georgia Gov. Ellis Arnall. Sarah Husain, a senior political science major who researched her honors thesis on political systems in Iraq, Lebanon and Malaysia among the Emory Libraries’ stacks and government documents collection, said after the session that she gained new insights from the session with Carter. The session concluded with Magee asking Carter to name a book that significantly influenced him. He talked about James Agee’s “Let Us Now Praise Famous Men” as helping him understand the relationship between place and character. The Rose Library has a signed first edition of the work. “This session accomplished everything we set out to do,” Magee noted. 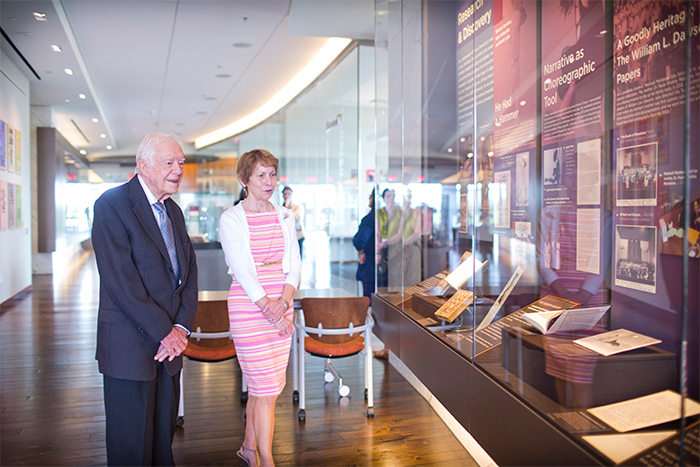 “President Carter had an opportunity to revisit the place that he used as his office for four seminal years during the planning and construction of The Carter Center. The students could experience firsthand the reflections of someone who is both a student of history and a public figure who has made history.